A rechargeable, air-breathing battery that can store up to 10 times the energy of today’s conventional lithium ion batteries could be just the breakthrough that makes electric cars practical—if it ever leaves the laboratory. Scientists worldwide are searching for the right combination of materials that could make a working lithium–air battery a reality, not to mention stand up to the rigors of repeated charging and discharging. Today, however, chemists have unveiled a material that seems to do the trick: gold. Researchers at the University of Saint Andrews in Scotland are the first to acknowledge that an electric car battery made of gold would not be practical. But by using gold in an experimental battery, they have taken a crucial step on the way to a viable mass-market lithium battery that can power an electric car for hundreds of kilometers between charges. 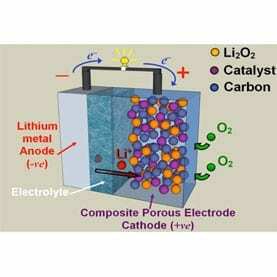 The Saint Andrews chemists, in a paper published in the journal Science on Friday, describe how an experimental lithium–air battery featuring an organic electrolyte (dimethyl sulfoxide) and a porous gold electrode maintained 95 percent capacity after 100 charge–discharge–recharge cycles. Scientists are interested in lithium–air batteries because the current lithium ion technology has inherent storage capacity limitations that doom it as a long-term option for electric cars. Lithium ion batteries used in electric vehicles rely on a metal oxide or metal phosphate (typically cobalt, manganese or iron-based materials) cathode as a positive electrode, a carbon-based anode as a negative electrode and an electrolyte to conduct lithium ions from one electrode to the other. When the car is driven, the lithium ions flow from the anode to the cathode through the electrolyte and separator membrane. Charging the battery reverses the direction of ion flow. The limited number of ions that can be stored in these electrodes, however, has prompted researchers to look in new directions.